Via Cronaca, thousands of Constantinian-era Roman coins found in British excavation. KOPN CAΛΩNIN, Diademed draped bust right on crescent | AΦPOΔI_CIEΩN, Tyche standing left, holding holding rudder with right hand and cornucopia in left. David MacDonald's The Coinage of Aphrodisias is quite good, and includes references for each obverse and reverse die, a degree of precision that's nearly impossible on imperial coins, which were minted in far greater numbers than were provincial city coins like this. The audience for catalogues of provincial coins is small, and the books tend to go out of print quickly. GALLIENVS AVG, Radiate cuirassed bust right | GENIVS AVG, Genius standing left, holding patera in right hand and cornucopia in left. Standard right. Q in left field. Idle amusement: my other GENIVS AVG coins from the mint of Rome all indicate the 6th officina (or workshop). With this coin I add my first example from the fourth, counting by using the first letter of the latin name of the number. By a hundred years after this was minted, the markings on imperial Roman coins was more rationalized and follows a pattern, if not perfectly. During this time, though, changes within a single mint can be used to provide relative dates, with no relation to what's being done at another mint. [D N ARC]ADI_VS P F AVG, Pearl-diademed draped cuirassed bust right, star behind | GLORI_AROMA_NORVM, Three emperors standing, each holding a spear. CONSA in exergue. 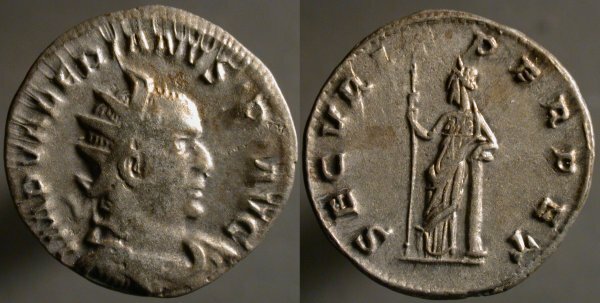 I went a bit out of order when I posted a coin of Honorius last week. Here's his older brother Flavius Arcadius. While Arcadius enjoyed a long reign, he didn't himself use it to strengthen the empire against encroaching barbarians, but instead worked for his wife's favorites (and against her enemies) in the church. In the meanwhile military figures fought behind the scenes, whether or not their own interests coincided well with those of the empire. Arcadius died in 408, of natural causes. AVT KAI [ΠO ΛI] ΓAΛΛIHNO CEB, Laureate draped cuirassed bust right, I before | ΠEPΓ_AIΩN, Pan seated left on rock, playing pipes, pedum behind right. 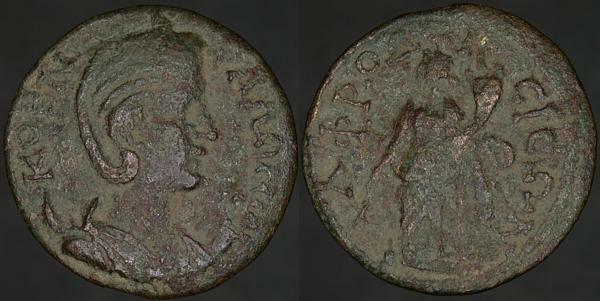 I've previously posted a coin of Salonina from this city with this reverse. I was happy to acquire this coin of her husband with the same reverse, a trivial step closer to an impossible completion. An additional benefit of having a number of coins from this city is that it provides the tools for making educated guesses about, for instance, coin legends which are obscured by wear of the adhesion of mineral deposits. I think Luna is the name you were looking for. IMP VALERIANVS·P·AVG, Radiate draped cuirassed bust right | SECVRIT PERPET, Securitas standing left, leaning on column right and holding scepter in right hand. Securitas was the goddess of security and is often seen, as here, leaning against a column. Her pose here is better executed than on other Securitas coins I have. I don't foresee ever completing a collection of every variety of coin minted for Gallienus, it's not even something I'm attempting (the price of Roman gold gives me the jibblies, for instance), but when I see a coin offered, the first test is if it's different than what I already have, then if I find the condition acceptable, then if the price, too, is acceptable. If a coin is particularly artistic or historic, that's nice, but not what matters most to me.